How long is the rental duration? Prices include up to 6 hours of fun! This does not include set-up or take-down time, so that you may use your entire rental duration to play. Note: We do not have lower rates for duration shorter than 6 hours. What is the cost to rent an inflatable? Do you offer any specials or military discounts? Does the price include delivery, set-up, and pick-up? Please see our Pricing & Specials page for current pricing and discount opportunities. Delivery, set-up, and pick-up is INCLUDED in our standard delivery area--- Pearland, Friendswood, Alvin, Brookside Village, Sagemont, and Manvel. For information about additional delivery areas and fees, please see our delivery fees & minimums page. Can I keep my rental overnight? 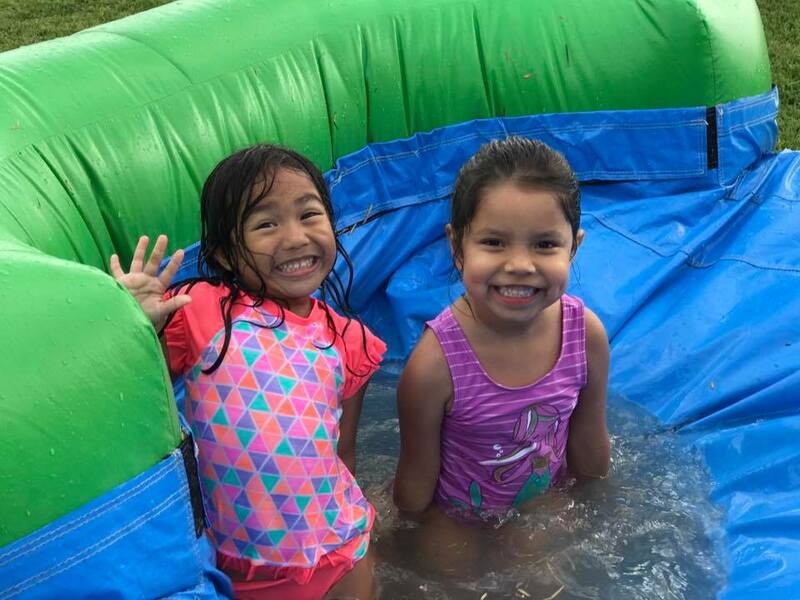 We have an overnight fee of $50 for waterslides within our free delivery area-- Pearland, Manvel, Alvin, Sagemont, Rosharon, and Friendswood. While ordering online, select 2-8 PM on the first day of your rental ONLY. If you go to the next day, it will charge you a lot more than $50. At the end of the checkout process, you'll have an option to select "overnight rental." If you are not renting a waterslide and/or you are outside of this area, we typically do not do overnight rentals. Please email Events@HopperMoonwalks.com if you would like to see if we can accommodate. How can we get a custom quote for an event with more than one inflatable? I'm trying to book online, but the date that I would like is grey, shaded, or appears unavailable. We often have to close online ordering for dates that are at high capacity to ensure that we are able to serve you in your area. Please email HopperMoonwalks@gmail.com to see what we can do for you! Cash is preferred, but we also accept credit cards at online checkout or delivery. If paying by cash, please have exact change, as our drivers do not carry cash. Tips are welcome and appreciated, but not customary. Checks are accepted from schools, churches, and corporate accounts only. What if we need to cancel? What is your rain policy? We operate with "Golden Rule" policy. Please let us know as soon as possible if you need to cancel for any reason, including weather. If there is a possibility of inclement weather, this will likely be discussed during our confirmation call (and, at your request, again the morning of your delivery). We reserve the right to cancel in the event of forecasted high winds (20 mph ), low temperatures (below 40), or heavy rains/storms. We also understand that emergencies DO come up. If you are not interested in rescheduling, you will be refunded anything that you may have paid. Once we deliver and set up, no refunds will be given, as our work has been done. We only require deposits on orders over $400. If you prefer to pay in advance, you are welcome to do so via PayPal. To bypass paying a deposit via online ordering, select "Under $400" at checkout. Payment is due in full at delivery. Are we responsible if equipment gets damaged in any way? Yes and no. You are not responsible for normal wear and tear on our units. Seams may develop tears in high traffic areas over a period of time. If this happens please alert us at once so we can remedy the situation. If, however, damage occurs due to failure to follow our safety rules or negligence (i.e. not turning off the blower in high winds) you will be responsible for all damages up to and including replacement of the unit/blower, etc. Do you deliver to other cities outside your delivery area? Yes. However, minimum order requirements and fuel surcharges will likely apply. Please see our delivery zone page for more information. Do you deliver to apartments? We generally do not deliver to apartment complexes, unless special arrangements have been made involving the apartment owners/managers. We typically set up on grass, but we can also set up on concrete and other smooth surfaces. Please let us know if you will need the units set up on any other surface than grass, as special equipment will likely be needed. How early do you set up? That depends on how many rentals we have that day. Generally we arrive 1-3 hours before the rental time begins. If we have a high volume of rentals that day, we may need to set up as early as 5 hours in advance. You will not be charged for the extra time. We will call you the evening before your event with a delivery window, unless we have made prior arrangements. Yes, please. In the event of possible rain or storms, we will instruct you on what to do. We generally advise clients to turn off and unplug the blower when high winds or lightning are an immediate threat. How big are the inflatables? What are the exact dimensions? Please note the exact measurements for each unit before you rent. When in doubt, measure your space to make sure it will fit. Jumps need room to be staked and they need room for the blower and can´t rub against walls or trees as this may damage the jump. Please allow 4' clearance on all sides if possible. What are the differences in your combo units? 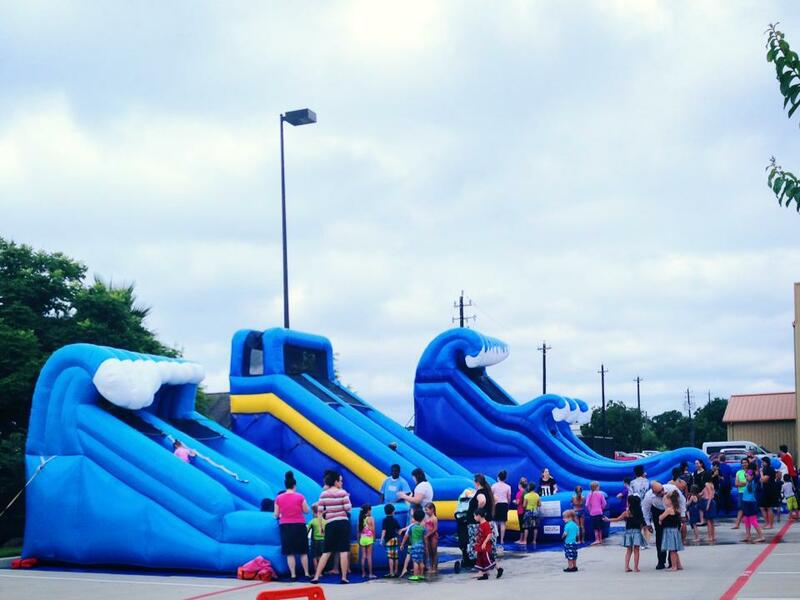 Each "Jump n Slide" combo is 29'x11'x15', featuring an 11'x11' bounce area and thrilling slide. Each "Bounce n Slide" combo is 25' x 13' x 15', featuring a 13'x13' bounce area, basketball goal, and shorter slide, designed for younger children. (Adults may also use this commercial unit. However, the stairs leading to the top of the slide may not support those over 150 pounds.) We recommend these for residential, backyard parties only. Our "pink/blue castle combo" and "tropical deluxe combo" feature a slide, obstacles, basketball hoop, and a 13x13 bounce area. Our premium "5-in-1 Combos" are roughly 18' L x19' W x15' H. They feature a bounce area with a basketball hoop, obstacles, climb, and a slide. Parents love the clear view sides and single entrance/exit! Hosting an "event?" This is the combo for you! Do your inflatables accommodate adults? Yes! Absolutely! 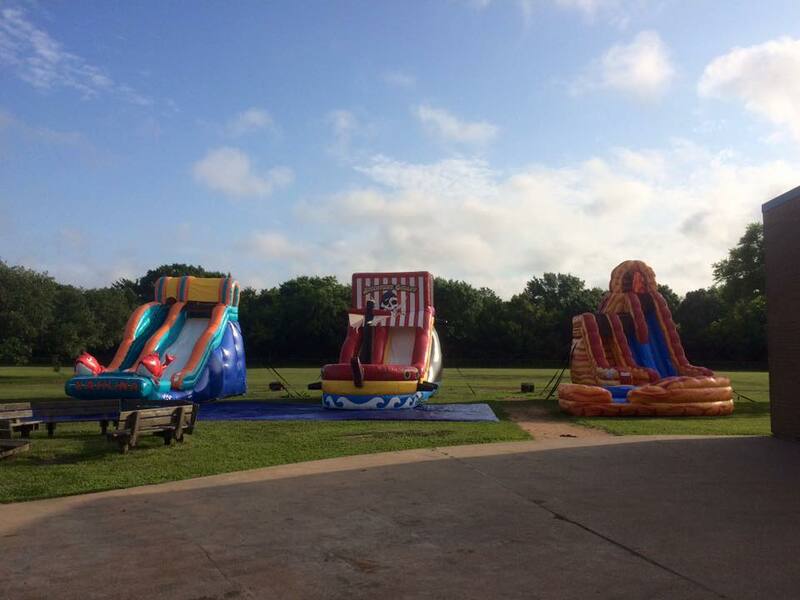 All of our inflatables are commercial-grade and may be used by adults. Our three "bounce n slide combos," however, are designed for children under 13. The stairs leading from the bounce area to the top of the slide may not support those over 150 pounds. All of our units should be CLEAN when you get them. We vacuum, clean and disinfect thoroughly after every rental. We want our inflatables to look and smell like new at all times!! What is the best inflatable for each age group? This age group is the easiest to accommodate! They love EVERYTHING. Do you provide extension cords? Do you provide water hoses for waterslides and/or dunk tank? We always provide heavy duty extension cords. However, we only provide water hoses upon request.Please notify us during or before your confirmation call. What are the set-up requirements? We typically set up on grass, but we can also set up on smooth concrete and other surfaces. Please let us know if you will need the units set up on any other surface than grass, as special equipment will likely be needed. Yes. There is a link in your receipt once you've ordered; or you may contact our office at any time. We will bring a copy for you to sign at delivery. Do you carry insurance? Can you supply us with a certificate? I can't believe I haven't reviewed these guys already! We use them for every event. They're always on time, everything is clean and well taken care of! The nicest people to do business with. We have used them every year for the past 4/5 years and they never disappoint!